Lee and Liz Dayton of Dallas, TX and Robert and Lani Graves of Williamsburg, VA have been friends for more than 30 years and have vacationed together extensively, including an Alaskan Inner Passage Cruise several years ago. This summer they will drive in an RV from Salt Lake City through the Canadian Rockies to Alaska and return through British Columbia to Seattle. They'll be on the road from July 14 to August 15. Lani, Robert, Liz and Lee embark on our Alaska adventure, leaving from Riverton, Utah. Unfortunately, at the last minute Scott and Norma Grove were not able to join the group, due to the impending birth of a grandchild. The Teton range at dusk from the shores of Jackson Lake at Colter Bay. Pronghorn Antelope. We counted 153 pronghorn, nine in Montana, a few in Utah and the vast majority in Wyoming. "Oh give me a home where the buffalo roam, and the deer and the antelope play . . ."
Flaming Gorge Dam. Fantastic place to fish, but we didn't take time for more than a quick try from the shore. Bridge across an inlet at Flaming Gorge, Utah. The Intrepid Explorers with Grand Teton in the background. Our group has voted this the most spectacularly beautiful place on the planet, at least so far! Lee and Robert have fond memories of two 19-mile hikes in the Tetons. 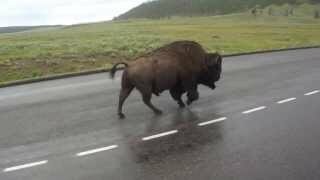 Sharing the road with a bison in the Hayden Valley, Yellowstone National Park. Artist's Point, view of the Lower Falls of the Yellowstone River. This spectacular canyon gives Yellowstone Park its name. Robert, Lani and Liz at Lewis Falls, just inside the South Entrance of Yellowstone Park. Special coaches for taking people up the "Going to the Sun Road" in Glacier NP. Our 30-ft. RV was too long to make the turns on the road. Our campground in Banff with Tunnel Mountain in background. We spent the night at a beautiful campground in Kootenay NP, near Radium Springs, BC. As we entered the town of Radium Springs, we saw a man photographing a life-size sculpture of a large Rocky Mountain Bighorn ram right in front of the park visitor center. Suddenly the sculpture rotated its head and then began walking down the road! We didn't stick around long enough for a video, but we got this great picture! Bridge in Banff, with Tunnel Mountain in the background. Our arrival in Banff, Alberta. Wonderful town to visit, with spectacular scenery at every turn. Getting back on the grid for a few minutes in Banff. Liz and Lee spy a moose near our campground in Banff. Victoria Glacier, above Lake Louise, from the trail to Lake Agnes. Lake Agnes, high above Lake Louise. This hike has a remarkable payoff in amazing scenery for a relatively modest hiking effort (3.4 km). 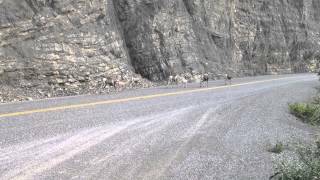 Video of the spectacular mountains, driving from Lake Louise north toward Jaspar National Park, AB, Canada. One of several glaciers at Wilcox Icefield Center in Jasper National Park. We spent the night in the parking lot here, along with many others, because the campgrounds in the park were fully booked. What an unforgetable setting, surrounded by glaciers! Lake Louise from the trail to Lake Agnes. Unbelievably beautiful mountains in every direction on the road north of Lake Louise, in Banff National Park, headed toward Jaspar National Park. Think of the Teton Range in Wyoming, but 100 miles long and on both sides. One spectacular view after another. Another spectacular view of Lake Louise from the tail to Lake Agnes. Beautiful mountains, with glaciers at every turn. Two whitetail deer enjoy the salad course in downtown Banff. Beautiful campsite at Pierre Grey's Lakes, with almost no one else there. Downtown Jasper. Great little town in a beautiful setting. 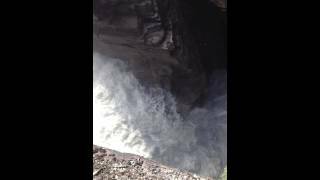 Top portion of Sunwapta Falls! A few miles further down Highway 93 toward Jasper are the Athabasca Falls on the Athabasca River. Another scenic wonder that defies description! Look for a link to a video when we get time to upload it. Video of Athabasca Falls on the Athabasca River, right off of Highway 93 south of Jasper, AB in Jasper National Park. Very popular tourist stop, and for good reason. We saw a temporary exhibit here by a park ranger, showing animals that had been killed, mostly by trains. Grain falls from freight trains, and then the animals eat the grain, standing on the tracks. We saw the hides of a grizzly bear, a wolverine and a caribou -- all fascinating. From the upper Sumwapta Falls there is an easy hike of just over two miles round trip to the lower falls. In addition to another amazing waterfall, the mountain scenery is also stunning. Just off the road on Highway 93 in Jasper National Park on the way to the town of Jasper are the Sunwapta Falls on the Sumwapta River. Within a hundred yards of the parking lot are these amazing falls. Here is a photo and I'll post a video when I get a chance. Lower portion of Athabasca Falls. This "tunnel" adjacent to Athabasca Falls was carved for thousands of years before the river found an easier path through the rock, creating the present channel. Another view of Athabasca Falls, complete with rainbow! All over the Canadian prairie (Grande Prairie is very aptly named!) we saw breathtaking fields of this yellow-flowered crop. While waiting for the brake work to be completed, we met a delightful couple that was buying new tires – a retired farmer and his wife. He informed us these were fields of canola, a very profitable crop. They told us many other interesting things about Canada and the region. All of the local people we met were friendly and helpful. From Jasper National Park, we followed Highway 40 north through more amazing mountain scenery to Grande Prairie, AB. Hearing a grumbling sound from one of the wheels, we stopped for the night and had the RV checked out early the next morning. The good folks at Fountain Tire got us in first thing, fixed the brakes, and got us on our way again. Liard Hot Springs is a favorite stop along the Alaska Highway, and for good reason. We loved relaxing in the hot springs, which are in a subtropical mini-climate made by the heat from the springs. They are very hot, so we couldn't stay too long! Sharing the road (Highway 97) with this herd of big-horn sheep, just one of several herds we passed near Stone Mountain and Lake Muncho, BC. Beautiful campsite at Liard Hot Springs. We got the last one! Traveling north on Highway 97 toward Liard Hot Springs was a terrific stretch for spotting wildlife. We saw several caribou, including the one shown here, a few moose, numerous big-horn sheep, and a herd of bison. 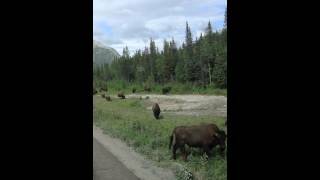 Buffalo herd moving along Highway 97 on the way to Lake Muncho and Liard Falls. In Watson Lake, just inside the Yukon Territory, we stopped at the Sign Post Forest. Started in 1942 by a homesick U.S. Army soldier, there are now more than 60,000 signs from around the world. This bench marks the border between the U.S. (Alaska) and Canada (Yukon). There are several very interesting plaques and monuments at the site. Behind us in this picture you can see where the trees have been cut down, forming a 25’-wide ribbon that extends in both directions marking the border. If this extends along the entire border it would take a Herculean effort to keep the border band clear of trees. Leaving the Yukon Territory, we arrived today in Alaska! Terrific visitor center in Fairbanks. Not to be missed. The beautiful and expansive Tanana River viewed from Alaska Highway 2 just east of Fairbanks. Pioneer Park was a very pleasant place to visit. We enjoyed a concert by the 484th Army Reserve Brass Quintet and Woodwind Ensemble, a great ice cream cone, and a tour of the Nenana, a twin steam-engine paddleboat that served communities along a 1,500-mile stretch of river. 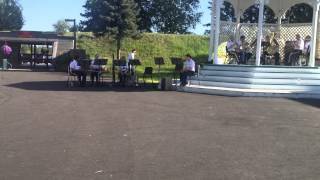 At Pioneer Park, the clarinet player in the Army band impersonates the Lone Ranger, complete with a stick horse, while the band plays the William Tell Overture. The audience also joined in with kazoos on the Colonel Bogey March – an unexpected pleasure. (Robert thought of Rinnie throughout the Colonel Bogey march, and of giving his four grandchildren horsey rides during the William Tell overture.) We’re having a great time, but missing all of you. We spent much of the day in the Museum of the North at the University of Alaska-Fairbanks. This is a wonderful museum with terrific exhibits, films and art. Lani, posing with Otto, an immense grizzly (brown) bear in the Museum of the North. Liz and Lani on one of the beautiful nature walks at Creamer’s Field Migratory Bird Refuge. We saw about a hundred Sandhill Cranes, which migrate between North Alaska and the Texas Gulf region. The pink flowers are Fire Weed, which we saw along many of the roads in Canada and Alaska. Stopped in Healy, AK in order to enter Denali NP the next morning. This is the setting sun at 11:40 PM -- the land of the midnight sun. Beautiful little church in Nanana, AK, on the way to Denali National Park. St. Mark’s Episcopal Church. Another unusual caribou at one of the rest stops along the way. One of about 25 caribou we saw during our day-long bus ride. This is just one of a great many wide gravel river beds visible in the park. The rivers never fill these broad channels, but carve new channels over time as the gravel banks collapse to block the stream. A great deal of water flows through these rivers, with more or less constant rapids, even though the elevation change seems very gradual. 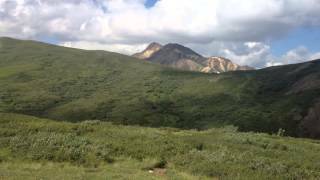 This video shows a 360 degree sweep of one of the spectacular views within Denali National Park. This is but one of a thousand spectacular views along the gravel road to Wonder Lake. At Denali National Park we took a shuttle bus to Wonder Lake. This 11-hour trip was a wonderful adventure with a delightful bus driver/tour guide who helped us spot wildlife while giving us all kinds of valuable information. This photo shows snow-covered Denali Peak (Mt. McKinley) peaking over the lower mountains in the foreground. It was visible to us for about 5 minutes, which means we were lucky. At this time of year, clouds usually hide the peak. At 20,320 feet, the peak is the highest point in North America, and its vertical rise above its surrounding terrain is much greater than that of Mt. Everest. Young bull moose along the way. Coyote, just off the road. On the way back to the visitor center we followed another coyote down the road for half a mile before he doubled back through the tundra. We also saw a wolf loping over a mountain ridge. Far up on the mountainside we saw this grizzly bear with her two cubs (only one of which is visible in the photo). 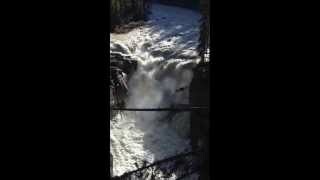 In Anchorage we saw dozens of huge salmon at the dam on Ship Creek. A bit further downstream we watched about a hundred people trying to catch them as they came through. A few were successful. As usual, we learned a lot about salmon and salmon fishing from a friendly fisherman. 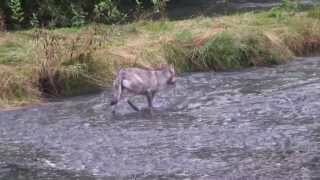 We stayed at the Willow Creek Campground west of Willow, AK, on the Susitna River. The campground is designed for people who fish, and there were many. We enjoyed watching them pull in various kinds of salmon, especially Silver (Coho) Salmon. Robert enjoyed visiting with an Eskimo woman (her term) and her Anglo husband who fish there every morning. Visited Earthquake Park and biked along the Tony Knowles Trail. We learned a lot about the 1964 earthquake and the destruction caused in Anchorage and by tsunamis in Seward, Valdez and other places. Here’s a view of the Anchorage skyline from Airport Park on the Tony Knowles trail. Lee and Robert took an easy one-hour hike to the edge of Exit Glacier. Signs along the highway and then the trail showed the glacier boundary as it receded, starting in 1815. Dodging rain showers, we visited Exit Glacier in Kenai Fjords National Park. We drove down the Kenai Peninsula from Anchorage to Seward with spectacular scenery all along the way. We ran into two very rainy days, so we decided not to go deep sea fishing or on a boat tour of Kenai Fjords National Park. Our disappointment was muted, because we had seen plenty of glaciers in our earlier Alaskan cruise. Here's Lee getting a ride from wooden sled dogs in Seward. Another beautiful campsite, this time along the banks of the Matanuska River near Chickaloon, as we headed up to Tok. Another view of a glacier and the cascading water flowing from it. We spent two enjoyable hours at the Begich, Boggs Visitor Center, seeing a terrific film about the Chugach National Forest along with lots of interesting exhibits. Another beautiful glacier viewed from the highway back to Anchorage. Beautiful glacier above the Matanuska River en route to Tok. The road from Chickaloon to Glennallen was one continuous 100-mile-plus scenic wonder! At about ten o’clock at night we saw a beautiful 360-degree sunset -- the clouds turned gold from west to east and all points in between. Half an hour later we saw this remarkable sunset looking more or less west. Matanuska Glacier at the head of the Matanuska River, near the edge of Wrangell-St. Elias National Park. This park is six times larger than Yellowstone, but has only two unpaved roads into it. We stopped at an interesting visitor’s center in Slana, but decided not to hazard the unpaved roads with the RV. View of the lake from the Snag Creek Campground, a few miles southeast of Beaver Creek, Yukon Territory. Back into Canada for the trip home! Spent the day watching one spectacular scene of glacier-laden mountains after another as we headed back southeast toward Whitehorse. Here's one of the best scenes. We missed these mountains and glaciers on the way west, because of overcast weather, so we were delighted to see them today. Just shy of Watson Lake, we turned south to take the Stewart-Cassiar Highway (Highway 37) through British Columbia. It was slow going on this road, with widely varying road conditions, especially on the northern half, but the payoff was well worth it, especially at Stewart and Hyder, AK. We camped at Boya Lake, with its beautiful aquamarine water. After spending the night in Whitehorse, YT, we headed east on the Alaska Highway (Highway 1), crossing the beautiful Nisutlin Bay Bridge near Teslin, YT. At Mezladin Junction we took a side trip down Highway 37A towards Stewart, BC and Hyder, AK, in what turned out to be one of the most rewarding parts of our adventure. The route is lined with beautiful glaciers and waterfalls. The scenery was spectacular, even on a drizzly, overcast day. This photo shows salmon spawning at Fish Creek in Hyder, AK, “the friendliest ghost town in Alaska.” The largest fish are Chum Salmon, while the greatest number of fish are Pink Salmon. He camped in Hyder so that we could return in the morning in hopes of seeing a bear feasting on the salmon. Just south of Tatogga Lake, Lee, Robert and Lani took a short hike to Kinaskan Lake. Along the path we saw at least twenty different kinds of wild mushrooms. This was one of the most interesting and beautiful specimens. Lani spotted this moose inside a hunting lodge at Tatogga Lake. 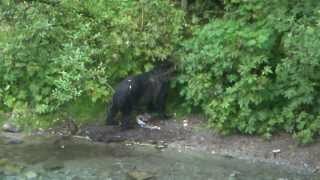 More video of the bear and wolf fishing near each other at Fish Creek. After a slight confrontation, the wolf gives the bear a wide berth. 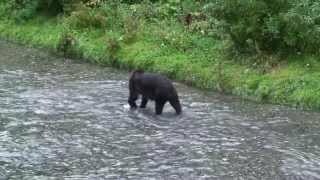 Grizzly bear continues fishing. She's not ravenous at the moment, and so is a picky eater. She may be looking for a Chum salmon or a female Pink Salmon. Bears prefer the eggs, brains and skin, and are less interested in the fillets when they're not really hungry. 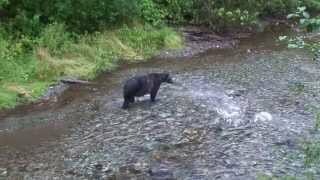 Female grizzly bear continues to fish along Fish Creek. At 5:30 AM, this female grizzly bear sauntered into sight below the viewing area at Fish Creek in Hyder, AK. 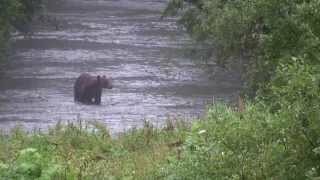 More video of the female grizzly bear and the gray wolf, fishing near each other. Here the wolf retrieves a salmon that the bear has caught and then abandoned. Here’s the beautiful Skagit River adjacent to our campground in North Cascades National Park. The boys loved throwing rocks into the bright green water. On Sunday night we stopped at a beautiful campground right next to the Skagit River in Sedro Woolley, where we fortuitously heard a great rock concert. On Monday we spent a wonderful day in North Cascades National Park with Jim, Martha, Lukas and Dylan Graves, just prior to their return to Williamsburg, VA following a summer law firm fellowship in Seattle. From North Cascades National Park we traveled east on Highway 20 toward Olympic National Park. Here we see the faithful Minnie Winnie getting a ride for once – on the Port Townsend ferry. After Jim and Martha and the kids departed, we drove up Highway 20 farther into North Cascades National Park. This amazing scene is from the Diablo Lake overlook. On the hike Robert helps give scale to the effects of the Great Blowdown. In Olympic National Park we stayed at the amazing Heart of the Hills campground. The campground and surrounding area are littered with huge fallen trees, the aftermath of the Great Blowdown, when 98- mph winds struck the area in February, 1979. Except for clearing out the campsites, you could believe that the storm took place a few months ago. The fallen trees have decayed very little in the past 34 years. After more than a month on the road, our adventure together came to an end today when Liz and Lee dropped off Lani and Robert at SeaTac airport. We had planned a last group photo, but the congested departure zone did not permit more than a few hasty thank-yous, hugs and goodbyes. This photo shows the faithful Minnie Winnie pulling away from the airport, closing out this amazing trip of a lifetime. Of course, the Daytons and the Graves are already beginning to plan their next adventure.